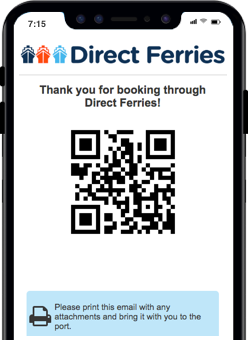 For more information, please visit our Ferries from Italy to Greece page. 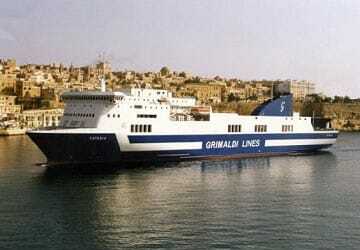 The Brindisi Igoumenitsa ferry route connects Italy with Greece and is currently operated by 2 ferry companies. 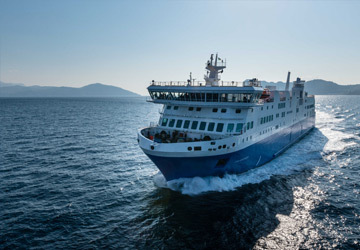 The Grimaldi Lines service runs up to 11 times per week with a sailing duration of around 7 hours 30 minutes while the European Seaways service runs up to 6 times per week with a duration from 10 hr. So that’s a combined 17 sailings on offer per week on the Brindisi Igoumenitsa route between Italy and Greece. Compare now and get the best fare at the time that you want to travel. Prices shown represent the average one way price paid by our customers. The most common booking on the Brindisi Igoumenitsa route is a car and 2 passengers. The cabin was clean. Cafe sells rather limited range of good. Staff were professional and helpful. Departure delayed so arrived one hour late. For the low price paid I would recommend this service. I have travelled with my wife from Italy to Greece on Euroferry Ignatia. The ship is huge, as a result the loading takes a lot of time and you need to wait in lines. We had no cabin, so I cannot share any information on those. I can, however, tell that if you feel inclined to reserve seats (like we did), you better not bother. The reserved seats are located on an upper floor, in two compartments lined up with aircraft- or bus-like seats. They can recline, but all in all they're not comfortable and you need to spend the night. Better try to board as early as possible and get yourselves a nice coach from the ones lining the walls in the hallways. There are roughly 20 or so places you can lie down and actually sleep well (but be aware that it's quite noisy, mainly due to traffic and playing kids whose parents do not bother to control them). The food is excellent, although a little expensive. Don't hesitate to eat at the self-service. The ship had no delay (a matter of minutes) and the trip was excellent - but we did have the benefit of calm seas. Service at the Ferry Port was good, however signage very unreliable also sat nav took me the wrong way would have missed the ferry if it wasn't for the Police as I was going the wrong way up a side street luckily. Language difficulty as they don't understand much English. Otherwise the journey on the ferry was good. Language and signage problems If it's the first time you are going like I was very helpful to know this. All the services were very good. The prices was reasonable. But as always the cleaning on this ships are poor. Hi, our journey with Grimaldi was excellent, quiet and all the staff was nice and the cleaning was good. I recommend it to all. "A ferry from the Middle Age"
The Italian city of Brindisi is located on the Adriatic Sea coast in the Apulia region of Italy. The city's port is a natural harbour and has played an important role in the city's, and wider region's, trade with Greece and the Middle East. On the north coast of the city particularly, there have been many important archaeological finds in the many sand dunes and on the beaches. Despite the port's economic benefit to the city, tourism still plays a major role in the city's fortunes. For visitors interested in agritourism, head inland from the city where wine (Wine Appia) and olive oil (Collina di Brindisi oil) is produced. From the city's port ferries operate to a number of destinations. Ferries to the Greek island of Cephalonia are operated by Maritime My Way Ferries. 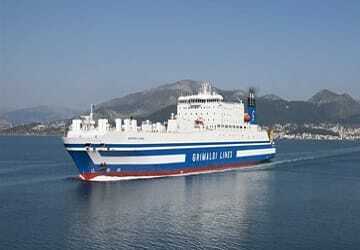 There are also ferries departing to Paxi , Corfu, Igoumenitsa, Zakynthos and Patras in Greece. The Greek city of Igoumenitsa is located in the north west of Greece and is separated from the nearby island of Corfu by the Gulf of Igoumenitsa. The city was, until the second part of the 20th century, a small port whose residents were mainly employed in one way or another with the fishing industry. The majority of the city's buildings are post war as the city was badly damaged during the Second World War. With many of the buildings constructed in the 1960's -1980's there are not many sites of historical interest to see in the city. Despite this there are some nice examples of modern office buildings lining the main street which stretches along the city's coastline. Most of the city's restaurants have terraces which enables diners to take in the lovely views of the coast whilst dining on fresh local produce. The best time to visit the city is between May and September as there is little rain and the temperatures are nice and warm. This enables visitors to explore the city and its surrounding countryside.